Etsy- of course! My shop is on etsy, as well as this awesome crocheted jackalope (I might have to buy this as a birthday present to myself), this tote bag, and this adorable plush kitty by Kitty Pinkstars. If you like Kitty Pinkstars' etsy, there's a giveaway going on at Miss Cuppy's blog that you want to check out! Shanalogic- I really love this site! 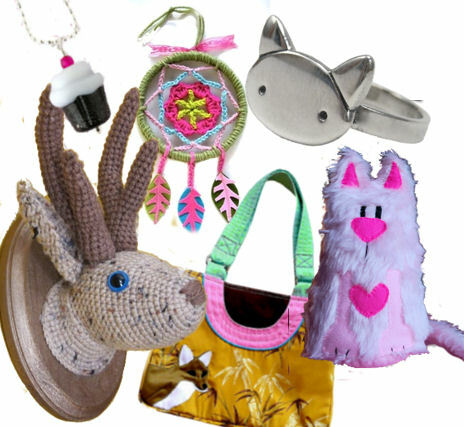 There's so much cute stuff going on, especially this cupcake necklace and kitty ring. Another one of my favorite shops is Lori Marie's from pretty little things. It was hard for me to pick out just one item from her store, but I really like this crocheted dream catcher. Her whole shop and blog are so lovely, I really encourage you to check them out. Look- I haven't killed them yet! What would you buy with $150?